It's season 2 of the Beer and Burger Fest at Hyatt Regency Chennai and if you like a brew with your burger, the Lobby Lounge has you covered. 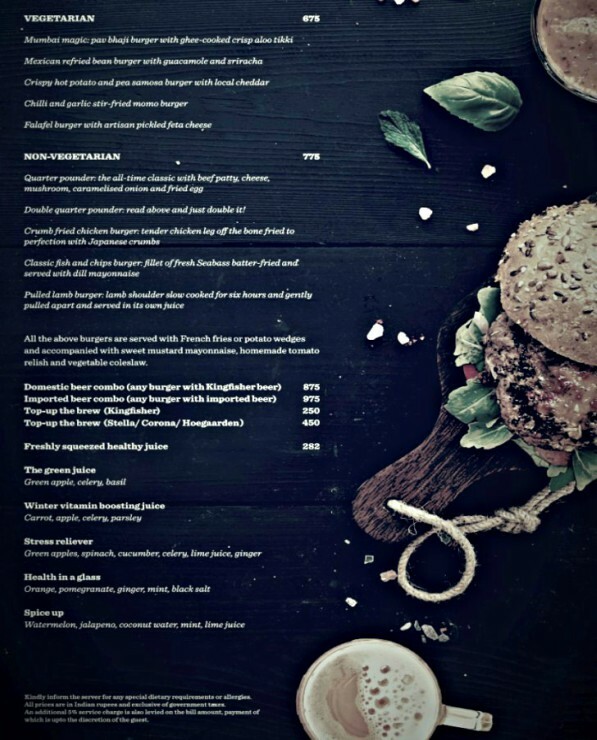 The menu is a little different this time and vegetarians have a choice of 5 burgers ranging from a pav bhaji to one with potato, pea and Cheddar cheese to another with chilli garlic stir-fried momo burger - extremely innovative or what!! 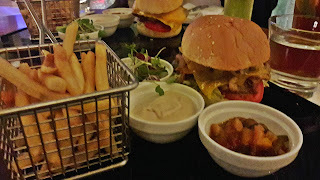 Since this was an invite to review, the friend and I, on Chef Arun's recommendation, ordered a crumb-fried chicken burger and pulled lamb burger. And just about then we were told that it was a "dry day" and no alcohol would be served. There went the beer! 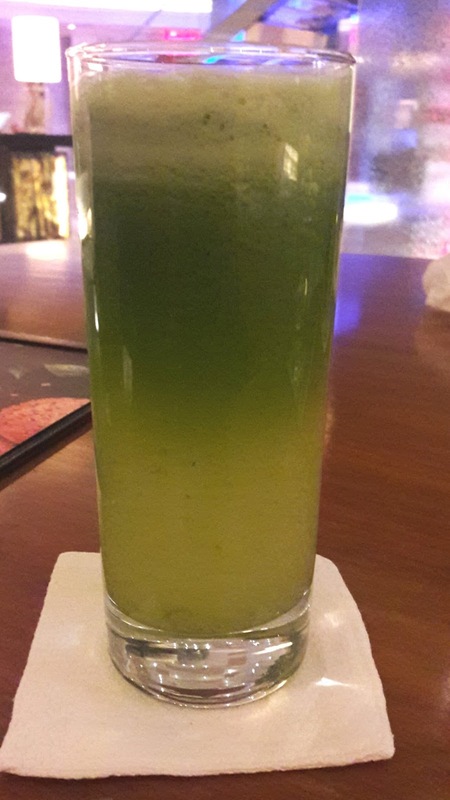 BUT...but that was a good thing as I wouldn't have got to order The Green Juice made with green apple, celery and basil. So healthy and refreshing and I could literally feel the vitamins and minerals gushing through my veins! There was another called Stress reliever; since I wasn't feeling stressed out that day, I gave it a miss. The burgers were served on black trays. 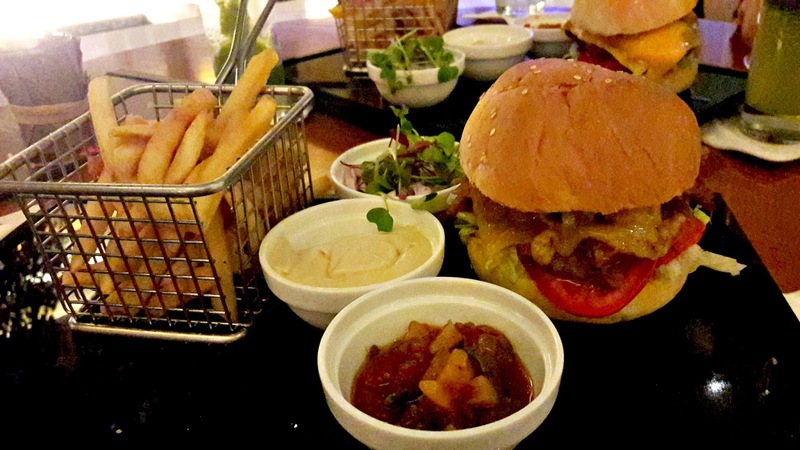 Each burger is served with a basket of fries, sweet mustard mayo, a red cabbage coleslaw and homemade relish. 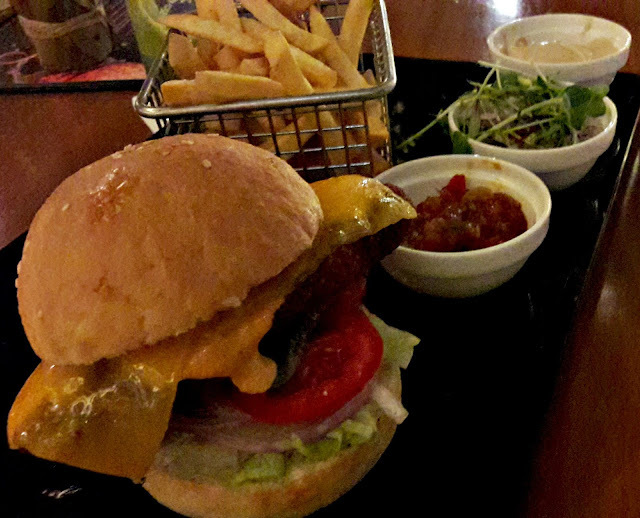 The burgers were well crafted, lettuce and tomato slices lined the bases. The pulled lamb filling was generous yet easy to cut through. Thankfully, there were no toothpicks or skewers to hold the bun halves together. The meat was oh-so-tender, having been cooked for 6 hours but I would have liked it with a little more heavy on the flavour and seasoning. The crumb-fried chicken burger, on the other hand, was a stunner. Meat from the leg of chicken had been coated with panko and fried. A slice of cheese placed on the hot patty melted, adding to its deliciousness. The crumb coating was so crisp that you could hear the crunch from across the room! Ok, maybe I exaggerate but I'd really like to know if there is an elegant way to eat a burger so good. To wash down those burgers, there's a choice of imported or local beers. 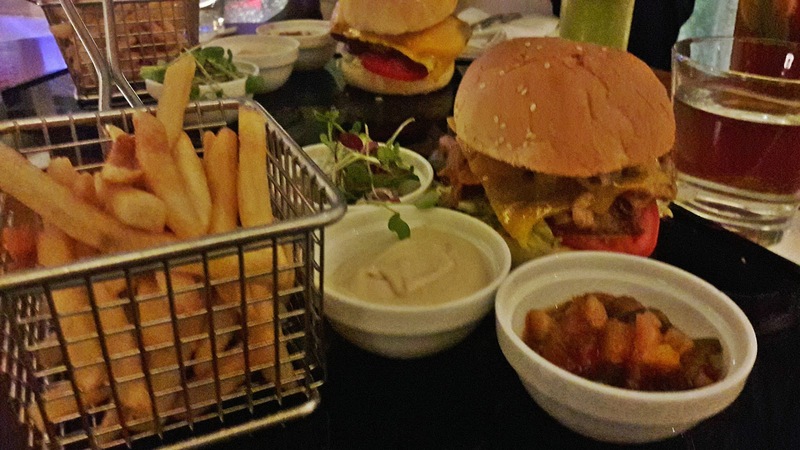 There are beer and burger combos which are a good deal and reasonable rates for top ups. 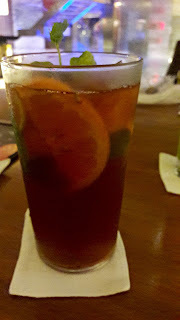 I also had a glass of iced tea. This one's not on the menu but you can order it. Very nice, very balanced flavours and it was a huge glass. Which reminds me, the burgers and the sides are pretty filling and you can make a meal of it. The fest is on every night till Jan 30th at the Lobby Lounge, from 11 am -11 pm.